For Doc Thomas, it’s all about winning. Not winning in the traditional sense, like coming first in a race or plowing through the Tour De France in a monster truck, but winning in the sense that you’re doing what you love, and freakin’ loving doing it. Toy collectors know that when you’re finally buying that most beloved, most waited for, most coveted toy, you are winning. When you’re opening that action figure up and changing accessories, posing it, switching interchangable parts, you’re absolutely winning. And when you’re putting your toys on display, or preposing them in battle, you just can’t stop winning. Of course, there are even more good times to be had when it comes to bargains, and on the odd occasion a store, sometimes online and sometimes brick and mortar, will have a toy that you really want marked down to a bargain price, forcing you to purchase it immediately. Bigger stores like department stores will often need to clear items quickly and put them at absurd prices, not realizing the value of sometimes very expensive toys; at other times local comic book stores will rope customers back in with sales, clearing items en masse for just pennies. When it comes to winning, sometimes bargains can be the absolute most win one can handle. 1. 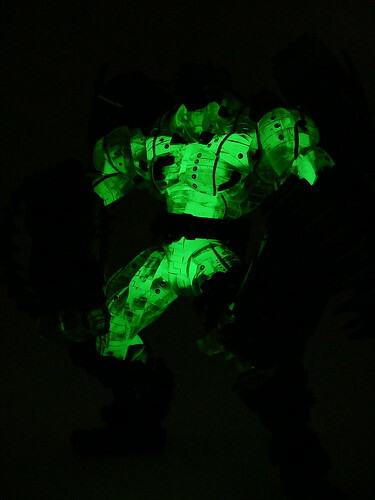 Variant Rare Glow-in-the-Dark Monev the Gale – for pennies!! I found this gem cut down to nearly US$10 on clearance at EB Games, of all places. In the early 2000’s EB Games had taken to stocking action figures at completely ridiculous prices (Spawn figures for $40, anyone?) with a special emphasis on marking up the shortpack to a ludicrous cost. When this went belly-up, nearly all of their toys were reduced for quick sale, and that was when I found this bad boy, a gorgeous amalgamation of sculpt, articulation, detail, paint and glow-in-the-dark goodness for the price of a large pizza. Bon appetit! 2. Complete Lego Basketball set – 90% off!! Not quite an action figure as such, but who doesn’t love Lego? Especially their ingenius sports sets, in which you can play sports with the little Lego dudes!! Perfect for myself rockin’ out in college, I found this marked down to a fiver at a Kmart, on clearance for 90% off. Ridiculous and awesome, I had no choice but to nab it!! Many good times were had with this in my little student housing flat. The only drawback? Now I’m straining to get the soccer set as well! 3. Rare Buffy Boxed Sets – for tuppence!! The rare and nifty DST Buffy boxed sets that collected sets of three figures by theme, many whom had never been made before, were a great buy for Buffy fans, but expensive. Then comes the local comic book store’s clearance sale, first-in-first-served – all three for a tenner! Score!! This was the only way to get Joyce Summers, as well as the immortal and loveable D’Hoffryn!! Webmaster Poe has his own fantastic bargain story that I did not exaggerate in the slightest – read on! What about you, humble readers? What’s your best ever bargain story? About a month or so ago I picked up Masterpiece Skywarp at Wal-Mart for $15.00!!! That’s less than the price of a Voyager class figure. When MP Starscream was released at Wal-Mart a couple years ago he retailed for $50, and FLEW off the shelves. When MP Skywarp arrived he retailed for $60 and warmed shelves like you wouldn't believe. Even when they cut the price in half to $30.00 months later they STILL couldn't sell them all. Sure the numbers eventually began to dwindle but there were still a substantial number on the shelf. I was not paying full price for this guy, and even at thirty he was too much. I kept waiting for them to discount him yet again. My patience was rewarded when I found him at WM for fifteen bucks. Thats just a few dollars more than the cost of a deluxe class figure. Considering I paid $100+ each for MP Prime and Megatron, and $50 retail for MP Starscream this was like a gimmie. I've seen the other side though. When Powerglide and Onslaught came out they retailed for about $25, and of course I picked them up immediately. Much later I found them EACH for $6. I was gutted. But you win some and you lose some in the Great River of Acquisition. (1) Ash and Evil Ash 12-inch figures from Sideshow for $7 each at Suncoast. (2) Four of the 12-inch Reservoir Dogs figs from Art Asylum for 75% off each ($5 each) from that now out-of-business mall record store whose name I cannot recall. I still have an unopened Tim Roth Mr. Orange. Sadly, these deals usually accompany a place going out of business. 10. Mezco 7" Abe Sapien (from first Hellboy movie) for less than $3 at a local NYC comic shop. 9. I've never paid full price for a Skeleflex set, and I own most of them. I've picked some up for as little as 90 cents at Toys R Us. 8. Star Trek Amok Time 2-pack for $5 at Toys R Us. 7. Star Wars 6 inch Titanium X-Wing and Tie Fighter for less than $5 each at Toys R Us. 6. Master Replicas The Great Gonzo Photo Puppet on Amazon for less than $100. 5. Yesterday I found a used Edna Mode for $3.99 at a consignment shop outside Seattle. 4. Dreaming PVC set for $4.00 at a comic shop in Silver Spring, MD. 3. Pigs in Space Swine Trek playset for $9 at KB Toyworks (how I miss those stores). 2. DCD Direct 13 Inch Bizarro, Joker, and Green Lantern at FAO Schwartz priced between $5 and $30. 1. Master Replicas Sting for $15 at Toys R Us. But the 1st Lego AT-AT for $20 or $25 on clearance at some Target in the middle of nowhere was great. I've posted about this elsewhere, but it never gets old: the complete Marvel Legends Fin Fang Foom Hulk set for $7 each at an Aldi supermarket. Saw them in the weekly advance store catalogue as arriving in the store in a week, staked out the store at opening time expecting every other nerdboy in Melbourne to be there too, but just me. Walked in, got all 8 and was out in ten minutes. So I got all 8 figs plus Foom for $56 total, and since I was only after foom I sold the figs on ebay for about $5-10 each, I ended up making my money back and effectively getting FFF for fffree! More recently i just got a wave 2 spider-man minimate for 99c on ebay. had to pay $5 postage, but it was worth it still. Marvel Toys final waves of TNA figures. They came out as Target was clearancing the old stuff so the figures debuted on the shelves at like $2.80 a figure. That or the Red Hulk wave which got clearanced from $15 to $6 to $3 in the span of two months. One of only two ML build a figures I built myself. BTW…let me just say…finishing a build a figure? THAT is winning. .42 cents including sales tax for a Toynami super articulated Robotech Alpha Fighter figure at Game Stop. The thing had nine or so layers of price tags on it on top of being in a 50% off bin. The bottom price tag said $16.99. I miss when Game Stop wasn't evil and still carried a good selection of toys. I got a couple of the Transformers G1 reissues for like 4 bucks at an out of the way TRU that never remodeled. They still have the long walkway entrance and the "cage" of video games. I got over 100 Mewtwo pokemon beanie-baby like things for a quarter. Total. Between my employee discount and some absurd clearance sale, they were reduced to less than a penny a piece at Toys R Us. Though I did piss off my friend who was the cashier because every single item had to be scanned individually.